As I close my eyes and picture Goa, I imagine azure waters, sun kissed beaches, pretty fishing boats, swaying coconut trees, picturesque Churches and a Kings beer in hand. This is my hometown, the Goa I so fiercely love. Goa is a coastal gem on the Arabian Sea. A former Portuguese colony and the smallest state in India, it attracts maximum tourists. While I grew up in Mumbai, every year as kids we went to Goa for our family summer vacay. 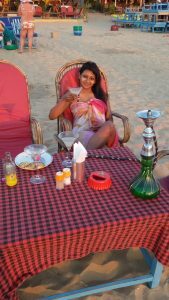 Even today I make it a point to visit Goa a few weeks each year relive, revive and refresh my senses. There are 2 parts to Goa, the buzzing, touristy and lively beaches, and the quaint, beautiful and charming country side. Journey with me as we stroll through paddy feels, old forts and pristine beaches and discover the real Goa that only few know about! 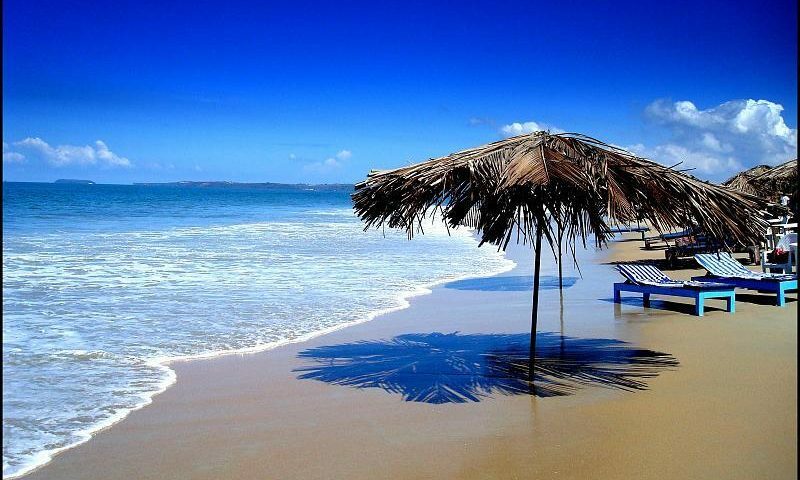 Being a coastal town, Goa is dotted with endless gorgeous beaches. Tourists typically know Goa as North and South Goa: North being the party spot, and South offering a more relaxing respite. North Goa has become a tourist hot stop with the famed beaches of Baga, Calangute and Candolim. Plenty of hotels, guesthouses, villas to suit all budgets are available. During the day the beach is covered with shacks, sun beds and water sport activities. I enjoy relaxing on one of the many sun beds in my bikini, gorging on tuna fish salad, or crispy calamari along with a Kings beer (Goan beer) with an occasional dip in the sea. For the adventurous you could try out a few of the water sports – banana boat ride, para sailing or Jet Ski. As the sunset paints the sky red and fishing boats sail out into the sea, beach boys replace the sun beds with chairs and tables and ready the beach for a romantic candle lit dinner along the waters. I generally return to my accommodation, freshen up and head out to hit the party circuit for some hip swaying music or a night of karaoke, or simply drinks and sheesha. North Goa offers endless opportunities to unwind and party. From the hippest nightspots like Cabanas – a disco in the hills, to Titos & Mambos the party goes on all night long. For those who prefer the bar scene, head out to Thalassa the pretty Greek restaurant on the Vagator hill overlooking the sea or hang around Cape Town café or head over to endless bars, restaurants, cafes all along the road or beach. If you happen to be in Goa during December to March, make sure to check out the Ingo’s Saturday Night Market in Arpora. It starts early evening and goes on till around 3am. There are shops selling jewellery, cigarettes, watches, designer clothes, clothes, shoes, most of them run by Russians. But even better is the huge variety of food available. I enjoy gorging on some Russian appetizers and mouth watering Belgium chocolate waffles loaded with strawberry and then head up to groove to some trance . If this is not your scene and you prefer to relax on quieter beaches, head up further North to Arambol and Morjem or down South to Colva and Palolem . My personal favourite is Patnem beach, extreme south of Goa, where I usually spend few days relaxing in one of the beach shacks, kayaking during the day and fast asleep at night as the sound of crashing waves echos down the shoreline. Away from the golden beaches and buzzing crowds, there is a Goa not many know, where susegad is the way of life, locals gather for the Cross feast and lush green rice fields form the landscape. Stay a while longer and discover this side of Goa. 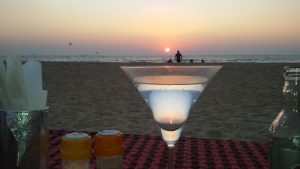 Learn to enjoy Goa like a true Goan. While Konkani is the state language, you will find Portuguese words loosely used in conversations by the older folk, including my grandparents. 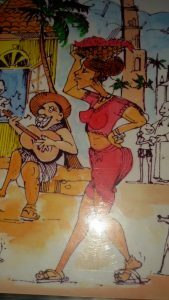 Goans are generally content in life and have a relaxed laid back attitude. The word ‘Susegad’ a Portuguese word is a common word used to describe this, where most shops are shut between 1pm to 4pm, allowing the owner time to go home and take a quick siesta (nap). Allow yourself to soak in the country side and discover the Portuguese influence in day to day life. Most houses and Churches are heavily influenced by Portuguese architecture. Once you stroll around a bit, it is easy to fall in love with these pretty, colourful, roofed cottages some of which are over 400 years old and still retain their deep wells from where water used to be drawn. Every neighbourhood has a story to tell. 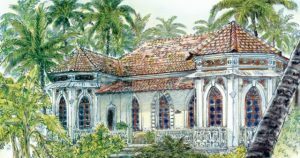 I come from a tiny, yet charming island called Corjuem in the Aldona district of North Goa. Our ancestral house is around 150 years old and built in typical Portuguese style. Opt to go to Aldona for a day trip, wander around the old baroque houses, visit the St. Thomas Church, which is built on a hill and soak in the beautiful landscape, watching as the ferry goes back and forth ferrying people across the river and village folk gather at the tinto (village market) to catch up on the local gossip. Head over to the Panjim bridge and watch as ships carrying iron ore from the mine to the harbour sail on the Mandovi river. Enjoy one of the many sunset boat cruises along the Mandovi, as dancers revel to Goan song and music. Spend time rambling about in the Friday Mapusa bazzar (market), as people from all over the country side get their produce to be sold. Try your hand at bargaining as you choose from a varieties of spices, fish, fruits or head over to Xavier’s café for some authentic Goan food. Reserve half a day to visit the many Churches of Goa. Goa is home to some of the oldest churches in India including the UNESCO World Heritage Site, the Church of Bom Jesus, dedicated to the patron saints of Goa, St. Francis Xavier, whose body is still preserved there. Let the charm of Goa seep into you and the laid back vibe of this beautiful state rejuvenate your sense. Entire Goa is dotted with quaint, pretty, charming cafes and restaurants. 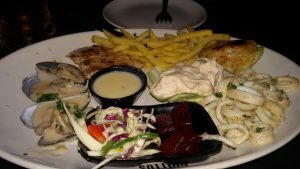 Goa being a big tourist spot, you will find cuisines from across the world, especially Continental, Russian, sea food and of course local Goan cuisine. As you ride your bike through the winding streets of Goa, you are bound to discover small, tiny cafes most of which are family run. Do not hesitate to stop here. Such places are hygenic and will give you an authentic Goan experience, while you chat up with the locals and understand their way of life. For vegans there are plenty of options to choose from as well, since all restaurant and cafes include a vegetarian menu. Vindaloo is the hot favorite in all Goan households. This masala can be used for chicken, fish, pork, beef. Mind you, it is delicious but very spicy. Chicken Xacuti is yet another spicy but irresistibly tasty dish made from Xacuti masala. Best time to visit Goa is October to March. The weather is cool, the mood is festive and the ocean is at its best. The annual Sunburn festival is held in December. Keep in mind Goa is a major tourist spot and the week from 25th Dec to 1st Jan sees Goa at its peak and is best avoided during this one week. 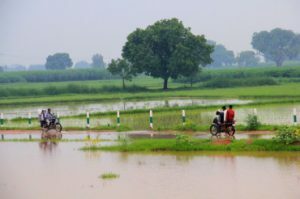 If you are someone who loves the rains, then visiting Goa during the monsoons, June – September is enjoyable: the country side is lush green, the weather is cloudy with occasional rain, and is less crowded and definitely cheaper. The festival of Sao-Joao (Saint John the Baptist) is also held in June. It is a fascinating festival where men jump into overflowing wells. There are several restaurants and shops offering currency conversion facility. ATMs are available all over Goa. Whether you’re planning a solo trip, family holiday, a quick weekend getaway with friends or looking to spend time with that special someone, Goa is the perfect holiday destination giving you the best of the party scene on the beach and the old world charm of its country side. Previous Post:What Travel means to Me!